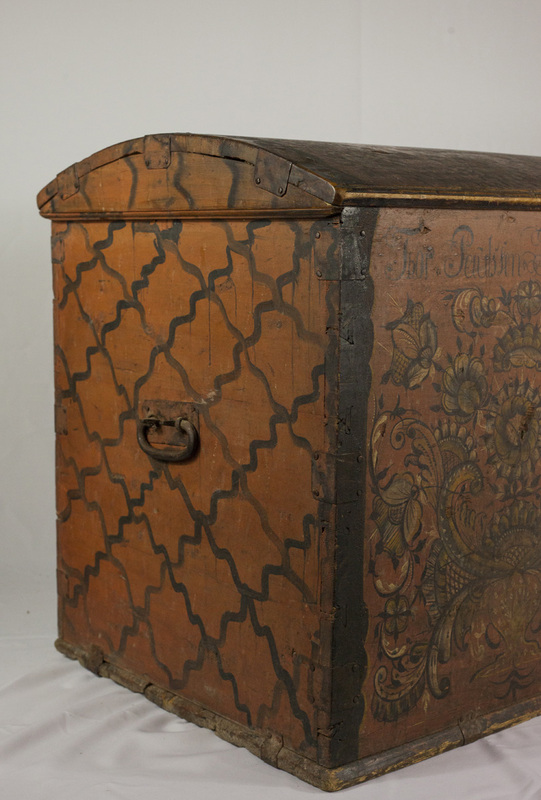 Decorated Norwegian chests served as vessels from a distant homeland for families making the long journey to America. They were transformed from a decorative yet functional container to an enclosure protecting the personal, the practical and the sentimental. They embodied psychological and physical security. Decorated approximately 20 years before arrival in America, this particular chest brought a family’s possessions to Perry Township in the mid-1850s. Having been passed down in the family, the chest was proudly offered to Little Norway by Guri Jeglum as a memorial to her Norwegian ancestry. Rosemaling, a specialized form of stylized floral painting with centuries-old roots in Norway, decorated these chests and many other household items that you will see in this exhibition. Once the decision to emigrate was made, the Norwegian farmer and his family coming to the United States for a better life had to separate their personal belongings into what to keep and what to permanently abandon. The objects that were selected themselves became vessels of nostalgia, as each object was a memory of their heritage. Trunks that transported those items of importance made it through thick and thin on their voyage to the United States. Across oceans on ships and ox carts to the Midwest, you can read the stories in the scrapes and dings. Not all trunks were originally made for immigration, many of them were actually dowry chests that were made for young women to store their belongings in preparation for marriage. These dowry chests were often used for storage as the tradition began declining toward the height of immigration. When new trunks were constructed, they were specifically rosemaled for the journey to the United States. The addition of rosemaling had the purpose of assigning the Norwegian folk art symbol of identity. A way of reminding them forever of where they came from, and to keep their homeland with them no matter where they traveled. Since they had to leave so much behind when they left, rosemaling gave immigrants a chance to bring much more than belongings with them. Dates were painted on the chests to mark important dates like emigration, or marriage on the dowry chests. Property like livestock, homes, and land had to be sold or auctioned off, as it could not be taken with to the new world. In The Trauma of Moving: Psychological Issues for Women, the feeling of loss experienced by immigrants is described as follows, “Leaving behind whatever embodies special memories and experiences— can feel like an amputation. It is the loss of a segment of family continuity, of personal history, the loss of a fragment of self.” This is why chests themselves became so important to the Norwegians. What Norwegians put in their chests gave them the ability to control something in the midst of all of the separation. The chests kept their most important belongings safe on their journey. Every. Single. Object. That was packed was touched by the emigrant, thus adding an intimate connection to the objects that were packed. Emigrants had to pack for a country that they knew nothing about, which added to the difficulty of what to leave behind. True Account of America by Ole Rynning, a guidebook for Norwegians coming to the United States, was published in 1838, and it provided advice that would be used on the trip and what was needed in the new world. Types of food, medicine, toiletries, durable goods for the home: bed clothing, furs, vadmel (a heavy woolen cloth used to make basic male and female traditional dress), artisan tools, items that would be unavailable to buy in the United States: spinning wheels, bakstehelle (a round flat iron plate for baking flatbread); things that could be sold in America to raise money: silver goods, tobacco pipes, rifle. In other words, it was recommended that Norwegians bring items that were rare, or expensive in the United States. Mr. Nicholas Gunderson, also of Madison, remembers the following Norwegian items from his childhood home: huge decorated chests for clothes and food, a spinning wheel, ale bowls, a quantity of smaller chests and boxes, brass candlesticks, sleigh bells, silver brooches and other jewelry, a heart-shaped smelling-salts case, and a large silver spoon. Among the various books that were brought along, he remembers especially well Tresehow’s Predikener over høimesse-texterne, published in Copenhagen in 1787. These chests carried more than just belongings. They carried memories, dreams, and hope of what a new world may bring. They are reminders of where emigrants came from, reminders of Norwegian roots that lived on through generations, constant reminders of the Norwegian ethnic identity. Audrey T. McCollum, The Trauma of Moving: Psychological Issues for Women, (Newbury Park, CA: Sage, 1990), 71.